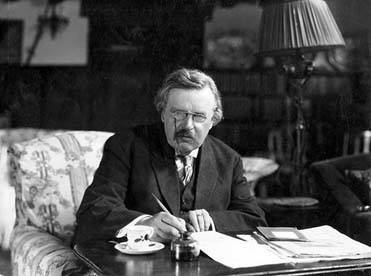 G. K. Chesterton, noted English Journalist, critic, and master of the detective story, defends the popular detective story, calling the genre a reflection of society, the "poetry of modern life." Bradshaw's Railway Guide contains few gleams of psychological comedy, yet it is not read aloud uproariously on winter evenings. If detective stories are read with more exuberance than railway guides, it is certainly because they are more artistic. Many good books have fortunately been popular; many bad books, still more fortunately, have been unpopular. A good detective story would probably be even more popular than a bad one. The trouble in this matter is that many people do not realize that there is such a thing as a good detective story; it is to them like speaking of a good devil. To write a story about a burglary is, in their eyes, a sort of spiritual manner of committing it. To persons of somewhat weak sensibility this is natural enough; it must be confessed that many detective stories are as full of sensational crime as one of Shakespeare's plays. The first essential value of the detective story lies in this, that it is the earliest and only form of popular literature in which is expressed some sense of the poetry of modern life. Men lived among mighty mountains and eternal forests for ages before they realized that they were poetical; it may reasonably be inferred that some of our descendants may see the chimney-pots as rich a purple as the mountain-peaks, and find the lamp-posts as old and natural as the trees. Of this realization of a great city itself as something wild and obvious the detective story is certainly the Iliad. No one can have failed to notice that in these stories the hero or the investigator crosses London with something of the loneliness and liberty of a prince in a tale of elfland, that in the course of that incalculable journey the casual omnibus assumes the primal colours of a fairy ship. The lights of the city begin to glow like innumerable goblin eyes, since they are the guardians of some secret, however crude, which the writer knows and the reader does not. Every twist of the road is like a finger pointing to it; every fantastic skyline of chimney-pots seems wildly and derisively signalling the meaning of the mystery. This realization of the poetry of London is not a small thing. A city is, properly speaking, more poetic even than a countryside, for while Nature is a chaos of unconscious forces, a city is a chaos of conscious ones. The crest of the flower or the pattern of the lichen may or may not be significant symbols. But there is no stone in the street and no brick in the wall that is not actually a deliberate symbol – a message from some man, as much as if it were a telegram or a post-card. The narrowest street possesses, in every crook and twist of its intention, the soul of the man who built it, perhaps long in his grave. Every brick has as human a hieroglyph as if it were a graven brick of Babylon; every late on the roof is as educational a document as if it were a slate covered with addition and subtraction sums. Anything which tends, even under the fantastic form of the minutiae of Sherlock Holmes, to assert this romance of detail in civilization, to emphasize this unfathomably human character in flints and tiles, is a good thing. It is good that the average man should fall into the habit of looking imaginatively at ten men in the street even if it is only on the chance that the eleventh might be a notorious thief. We may dream, perhaps, that it might be possible to have another and higher romance of London, that men's souls have stranger adventures than their bodies, and that it would be harder and more exciting to hunt their virtues than to hunt their crimes. But since our great authors (with the admirable exception of Stevenson) decline to write of that thrilling mood and moment when the eyes of the great city, like the eyes of a cat, begin to flame in the dark, we must give fair credit to the popular literature which, amid a babble of pedantry and preciosity, declines to regard the present as prosaic or the common as commonplace. Popular art in all ages has been interested in contemporary manners and costume; it dressed the groups around the Crucifixion in the garb of Florentine gentlefolk or Flemish burghers. In the last century it was the custom for distinguished actors to present Macbeth in a powdered wig and ruffles. How far we are ourselves in this age from such conviction of the poetry of our own life and manners may easily be conceived by anyone who chooses to imagine a picture of Alfred the Great toasting the cakes dressed in tourist's knickerbockers, or a performance of Hamlet in which the Prince appeared in a frock-coat, with a crepe band round his hat. But this instinct of the age to look back, like Lot's wife, could not go on forever. A rude, popular literature of the romantic possibilities of the modern city was bound to arise. It has arisen in the popular detective stories, as rough and refreshing as the ballads of Robin Hood. There is, however, another good work that is done by detective stories. While it is the constant tendency of the Old Adam to rebel against so universal and automatic a thing as civilization, to preach departure and rebellion, the romance of police activity keeps in some sense before the mind the fact that civilization itself is the most sensational of departures and the most romantic of rebellions. By dealing with the unsleeping sentinels who guard the outposts of society, it tends to remind us that we live in an armed camp, making war with a chaotic world, and that the criminals, the children of chaos, are nothing but the traitors within our gates. When the detective in a police romance stands alone, and somewhat fatuously fearless amid the knives and fists of a thieves' kitchen, it does certainly serve to make us remember that it is the agent of social justice who is the original and poetic figure; while the burglars and footpads are merely placid old cosmic conservatives, happy in the immemorial respectability of apes and wolves. The romance of the police force is thus the whole romance of man. It is based on the fact that morality is the most dark and daring of conspiracies. It reminds us that the whole noiseless and unnoticeable police management by which we are ruled and protected is only a successful knight-errantry.